For those of you looking for a nice center console that will fit one massive 10" or 12" sub, this is it. You may not have room behind your standard cab seat or under the rear extended cab seat for one big deep sub. But you have plenty with our console box along with the volume you need to pump out some serious bass. We had two goals when we designed this box. First, a simplistic design that is both ergonomic and attractive. The armrest section has a nice padded cushion on top so you can drive comfortably with your elbow on it. The rest of the console is stylish enough to blend in with your interior and not stand out like a big square box. The subwoofer installs in the back and faces the rear of the cab. This way we are not limited in depth like most downfire setups. Consoles will be available in various colors. The armrest section is covered in automotive vinyl. The base is covered in your choice of plush carpet. Pick your covers and colors below. Our example above shows the armrest and console with the same shade on it. If you'd like your cushion in a different color, we can do that too. Just make those selections. Also, we offer two internal volume choices. Max volume is 1.16 cu.ft. We also have a smaller volume of .75 cu.ft. available. (your choice). Doesn't matter if the sub is a 10" or 12", you can select the volume you want. These are sealed boxes, we will not make ported versions. Note: The above pictured cupholder insert is Not included with this console. You will need to purchase that item separately if you choose. The pictured unit works really nice and as an option we can pre-cut the hole in the top of the console for you. 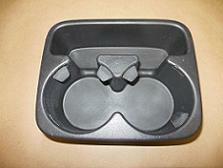 This way, you can insert the cupholder that you buy directly into our hole for a perfect fit. 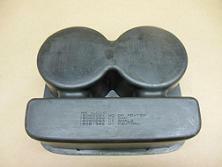 Search ebay for 98-02 tahoe, silverado, suburban cupholder. For a better look at this specific cupholer, click the more images tab. Box Size: Select Smaller Box .75 cu.ft ft. Larger Box 1.16 cu.ft.